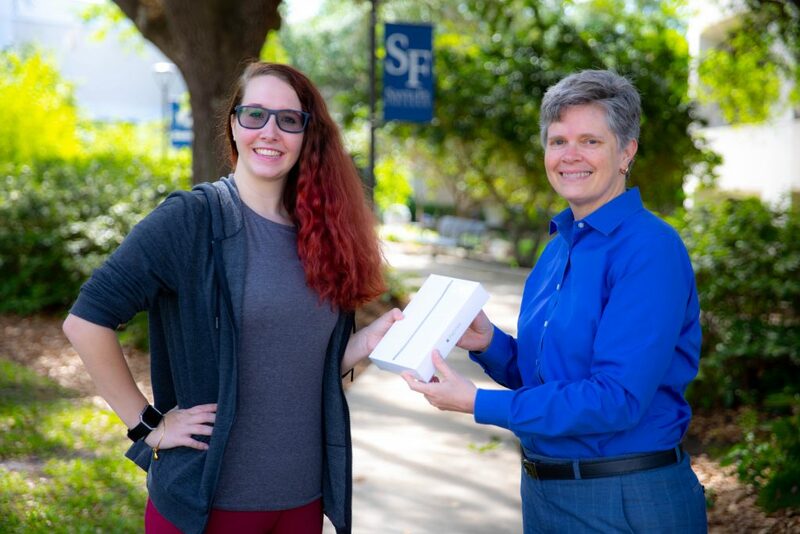 Cheryl Calhoun, Ph.D., Dean of Access and Inclusion, presents Megan Bossert with an iPad Mini on April 8, 2019, in Gainesville, Fla. Bossert won the iPad for completing the National Assessment of Collegiate Campus Climate (NACCC) survey. April 8, 2019 – Santa Fe College recently participated in the National Assessment of Collegiate Campus Climate (NACCC) survey. The purpose of SF’s participation is to get information from students about their experiences with race, not only at the college, but also in the community and throughout their lives. Over the course of six weeks stretching from February through mid-March, SF students were encouraged to give their thoughts on issues of race and inclusion, and how those issues have influenced their world view. As an added incentive, one student who completed the survey would be randomly selected by the NACCC to receive an iPad mini. Nearly 2,000 students completed the anonymous 15-minute survey. Megan Bossert saw the emails and the notifications on Canvas, took the survey and was selected as the winner of the iPad mini. Bossert said she plans on lending her new iPad mini to her father who will be traveling to Scotland this summer and won’t be able to bring all of his books with him. Officials at SF say they will be receiving a customized report and recommendations based on survey responses from the USC Race and Equity Center in the fall. These recommendations will help us in continuing to make our campus more inclusive. Learn more about the NACCC online at race.usc.edu/naccc.